I have explained a few times already that when we are dealing with objects, most of the times we are not working with the original class itself – the blueprint, but we are actually create copies of it called instances. The process of creating an instance (copy) of a class (blueprint) is called instantiation. In this light, we can say that an object is the instance itself. Like I explained in a few occasions already, we can imagine this process of classes and their instantiation by making a similarity with the real world. In the previous lessons, we have used our Oven class to demonstrate the purpose of creating an Oven object. In real life, this would be the blueprint, the prototype of the oven. In practice, we are not going to make a new blueprint or prototype each time we are going to sell an oven. Instead, we will use that blueprint to create many copies of it, which can be sold. The copies can be customized, for example, a set of ovens can have their color white, while others can be gray. The original unique blueprint doesn’t specify a color for the oven, it only specifies that the oven can have a color. Similarly, when we create a class, we are actually creating a blueprint. When we will want to use that class, it is very rarely that we will actually use the class itself. Instead, we will create copies of it called instances. These instances can be customized, and they are independent one of another. In official programming manuals, you will encounter two terms: the state of an object and its behavior. 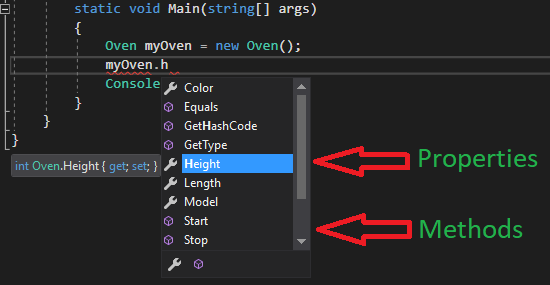 While the state of the object is specific for each object itself (for example, our Oven‘s object color, or model, which can be individualized for each item), the behavior is common for all instances of that class (all Oven objects have a TurnOn() or TurnOff() method). But, enough talking. Lets actually see how we are instantiating a class, though we have done this a few times already. Starts to looks familiar? We learned by now that the way we are declaring a variable is by specifying its type, followed by its name. So, we can see that instantiation is nothing else but the creation of a variable, of a custom type. 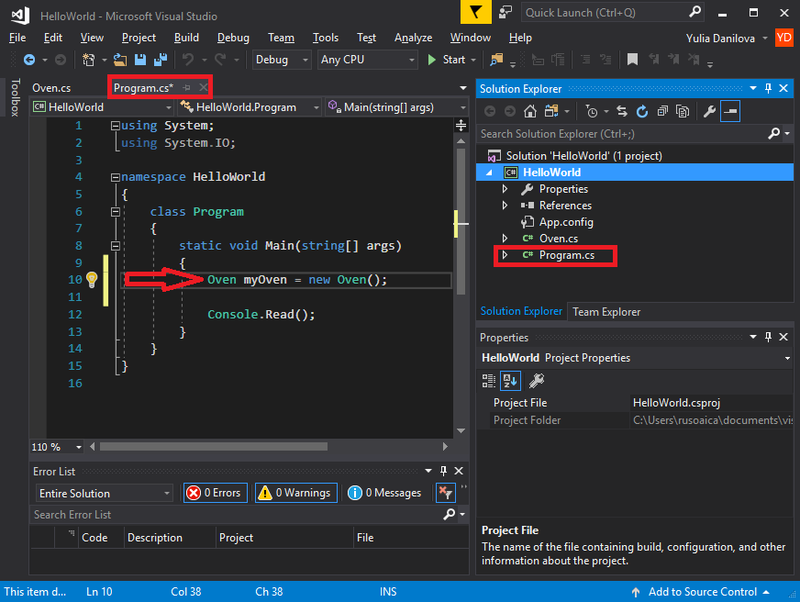 Instead of creating a primitive type (types defined by default in C#), we are actually creating a new type. In conclusion, we are declaring a new variable of type Oven. because the compiler will complain about Use of of unassigned variable. But, in the case of our Oven variable, we can’t specify a default value, because there is no default value specified for our custom type. Instead, we need to make a call to the constructor of the class, of which we talked in the previous lesson. objects declaration and initialization is also called instantiation. objects can only be initialized by calling their constructor. calling the constructor of an object always requires the new operator before the call. all primitive types (int, float, bool, etc) except string are value types. Objects are always reference types. will not give us a compiler error, even if we did not specifically initialized our Weight property with any value. Instead, the console will display the default value for the type of the the Weight property, in this case, 0, because 0 is the default value of type int. This entry was posted on Wednesday, April 26th, 2017 at 16:15 and is filed under Objects. You can follow any responses to this entry through the RSS 2.0 feed. You can skip to the end and leave a response. Pinging is currently not allowed. Posts (RSS) and Comments (RSS). 508 interogations. 0.503 seconds.